This morning I followed the directions to a T from the guidance in the link below. After completing the swap the car will turn over but will not crank. It and the donor both ran at the time of the swap. 1: In a rush mistakenly cut the Hall Sensor wire. I reconnected both insulated wires and the uninsulated ground and sealed it up. 2: I buggared up the yellow and red striped pin when I was attempting to remove it. Not bad but, not great. Looks like it should work. Any similar experiences / solutions would be very much appreciated. Update: Appears there is no spark. Fixed the botched red and yellow in #24 with a new pin. 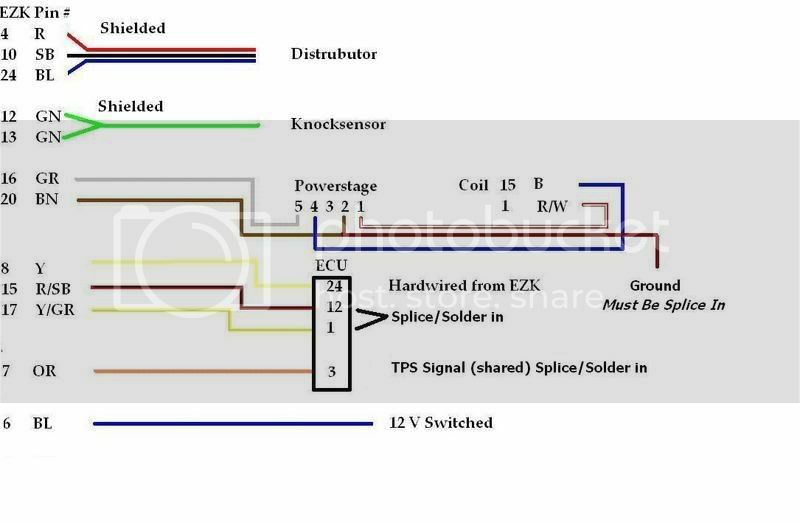 In the wiring diagram it shows spliced connections from 17 to 1 and 7 to 3 from the EZK to the ECU. However, in the step by step guide there is no mention of splicing these. Was this an oversight or was it assumed? Gave up, reinstalled Chrysler, fired right up. 1: Purchase complete wiring harness for both ECU and EZK from DB’s site. Sorry to hear about your issues, I had similar ones that haven't been resolved yet. Been too busy to spend much time on the volvo lately but i'ts been rather annoying to perform a simple bolt on procedure to a car that was running and have it dead. I'll attach a link to one of my threads that got about as much attention as yours. I bought a brand new Dave Barton harness in hopes of throwing money at the problem but still it sits not running. There's some issue that pops up from time to time with this conversion but I haven't found an answer. I hope you have better luck. FWIW I wish I had taken the advice of my local Volvo guys and just went to megasquirt from the jump and been done. Look into that before you pull the trigger on the harness. Also, for cleanliness, I noticed that instead of running the wires to the connector under the intake you could directly connect the wires from the EZK to the ECU and I did so which meant I only had to run 5 wires out of the cabin. Keep the black/red stripe, yellow, and yellow/red stripe inside the car. So you have a fat connector that the thick gray wire from the harness goes to. This is the connector for the powerstage. The brown wire coming from the powerstage connector needs to connect to the brown wire coming from the EZK connector(if it is not already connected). Then you want to ground a wire and tee this grounded wire into the aforementioned brown wire that goes from the powerstage connector to the EZK connector. Then you will notice that you have 3 more wires coming from the powerstage connector itself: blue and 2 white/red stripe (one thicker than the other). Connect the blue wire to the positive terminal on your coil. Connect the thick white/red stripe wire to the negative terminal on your coil. Finally connect the thin white/red stripe wire to the white/red stripe wire that goes to your tach. Now is also a good time to take the solid blue wire coming from the EZK harness (should be same color as the one from the powerstage connector) and connect it to the positive terminal on the coil as well. So to recap we have blue from main EZK connector and blue from powerstage connector to the positive terminal on the coil. We have thick white/red stripe connected to negative terminal on the coil and thin white/red stripe connected to the tach wire. Finally, a brown wire going from the powerstage connector to the EZK connector with a grounded wire teed into it. Get your snorkels on because we're going swimming for a little, 2 wire, black connector located under the intake manifold. It should have an orange wire and a gray wire in it. Once you find it, unplug it and cut off the connector with the MALE spade terminals in them making sure to leave yourself enough wire to solder. Now you will most likely have to extend both the gray/yellow stripe and orange wires coming from your EZK harness and then connect them to their respective gray and orange wire mates from the small connector you just removed. Now plug the connector back in to its female half under the intake manifold. Unplug connector on hall sensor on distributor, take the thick black wire with 3 prong connector coming from your EZK harness, and plug this connector in. Done. Get your snorkel back on and start digging under the intake manifold again. Unplug and then unscrew the old knock sensor from the block. Now take your new knock sensor from the donor car and it's respective mounting bolt and bolt it into the hole you just opened up in the block. Now connect the fat green wire from the EZK harness with 2 prong connector to the knock sensor you just bolted on. Done. You need to open up the connectors of both the EZK and ECU harnesses. They are held together with 3 little screws. Once inside you need to track down the yellow/red stripe wire that is in the EZK harness. Take a precision screwdriver and remove the pin from the EZK harness connector that this wire goes to. If you must cut the wire to extend it try and keep as much of the wire as you can to make soldering the extension easier. But keep the little pin no matter what. Take this pin with wire (extended if you had to) and connect it to the yellow wire coming from your EZK harness. Now insert this pin into pin slot number 24 of your ECU harness connector which should have nothing in it. Now take the black/red wire coming from the EZK harness and connect it to pin 12 of the ECU harness. Installed the sweet new harness, quality is legit. First crank with the EZK 117 and 541 Turbo ECU the car started, ran briefly, spit, sputtered, and stalled. Looked like the timing was way off. I put the NA ECU back in and ran it with the EZK. The car ran but idled rough and the vacuum gauge was bouncing between -5 and -10. I checked the timing and it was retarded well past the scale. Once driving it smoothed out and ran great. So I drove it to Atlanta Volvo (solid dudes) to have an oil pan with oil return and new motor mounts installed. Low and behold after the drive the idle timing was rock solid at 0 degrees and the vacuum gauge also read rock solid at -20. Don’t know how or why but, sometimes things just work themselves out. Now the question is, will it work with the Turbo ECU after whatever issue it was ironed out? We’ll see tonight. Last edited by Hutch. 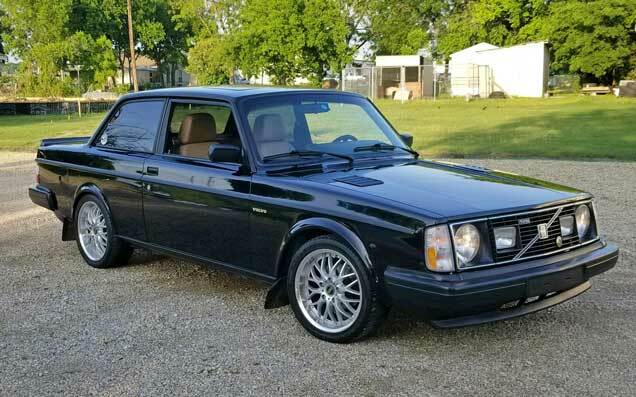 ; 01-21-2019 at 07:11 PM..
A self-healing Volvo. That car is a keeper. Are you swapping in 30ish lb injectors along with the turbo ecu? I have a set of 9186340 injectors and a 3 bar FPR. I haven’t swapped them out yet though. Everything I’ve read seems to imply stock will work for just the EZK ICU / Turbo ECU swap. I’m not executing the +T until next week. If it doesn’t work later tonight with stock injectors I may stay up late and give the new ones a go. Right? Better to be lucky than good. You don't have a self-healing volvo, you not matching the injectors to the ecu is the problem..
You missed the point. That may be the issue with the turbo ECU, I’ll check it out when I have more time. The issue that fixed itself was a poor idle with the NA ECU. Running better than it ever has now. New injectors and the car runs great with the Turbo ECU. EZK swap complete, finally. Time for the Turbo. Sweet merciful Vishnu! I swapped in a set of light blue injectors I picked up from who knows where and my car runs after so much wasted time and money. I don't ever recall seeing that you had to swap injectors to run a Turbo ECU. It doesn't want to idle yet but I'll mess with that issue tomorrow. At least the damned thing runs again. Yep, gotta match injectors to the ECU: 19's with NA, 30ish with Turbo. That idle almost always clears up with time/driving, it's just the ECU figuring stuff out. Edit: Also, if the parts all came from different cars, might have to adjust the AMM to match the injectors better (only a thing on LH2.2, it's the little screw on the AMM).